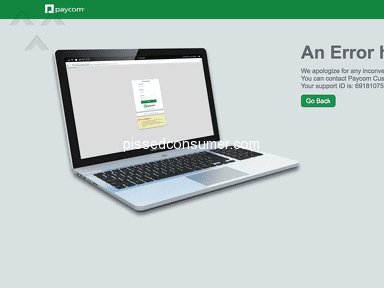 Next review Paycom - Payroll Nightmare! Jul 13, 2018 We apologize for your frustration. Please contact your HR/payroll team to reset your login and security questions. We’ve shared your feedback with both our client and product support teams, who have reached out to your organization. We appreciate you making us aware of your experience and look forward to working with your organization to resolve your concerns. The site itself is glitchy, and the login doesn't work consistently. Often I get a message that my username and password are incorrect, only to change and still experience the same issue--after the hassle of entering my security questions and switching to another secure password. I hope my company changes vendors. Paycom is the worst. The attached photo is only one of the latest issues I've experienced. Sometimes the login doesn't work in Chrome, sometimes not in Safari. What are customers supposed to use, Netscape? I have to access the site from Turkey, and the issues never stop. Today, I tried repeatedly to log in with multiple browsers, but could not do so until using a proxy vpn, and could not submit a time sheet because the browser detected that my local time was different. Why so many issues? Paycom needs to address these user issues. I work for a large NGO, and I know that many of our employees experience frustration with this site. I didn't like: It is unreliable-login and security is horribly glitchy. Review #1298701 is a subjective opinion of VagueYorkshireTerrier394.